CicLAvia isn't just for bikes. Five Angelenos play/perform capoeira, the Brazilian martial art/dance in the middle of Spring Street. Photo by flickr user srd515. As someone who plans to enjoy CicLAvia on foot this year, I appreciate this call for courteous and thoughtful sharing of the road this Sunday from some of Los Angeles’ foremost bicycle and pedestrian advocates. CicLAvia organizer Joe Linton puts it well when he encourages “all participants…to bring mutual respect, common sense and a willingness to engage with each other.” If you’re cruising around on two legs — as opposed to two wheels — like me, consider bringing a copy of the official CicLAvia architecture guide (PDF) with you. When the Crenshaw Line opens to the public later this decade, riders will be able to transfer at the northern end to the Expo Line and head toward the beach or downtown. But what about an extension of the Crenshaw Line further north to Hollywood? Such an extension is listed in Tier 1 of Metro’s long-range plan, meaning it’s currently unfunded but considered a high priority project in the future. Dan Wentzel of the blog, Ride the Pink Line, weighs in on how the Crenshaw Line might proceed from Expo/Crenshaw to Hollywood/Highland. The primary routes Wentzel considers are a combo of San Vicente Boulevard plus La Brea, Fairfax or La Cienega. Wentzel notes that there are some tradeoffs to consider here between going for the most direct route (La Brea) versus one that hits more destinations (Fairfax or La Cienega). The California High-Speed Rail Authority has signed off on the latest of iteration of the state’s plan to connect the Bay Area to So Cal. The approval included an amendment that will bring Anaheim back into the fold after a one-seat-ride to Orange County had been previously shelved to save costs. The proposal now heads to the State Legislature for approval — where it’s likely to encounter some skeptical members — before Gov. Jerry Brown can sign off on the beginning of construction. The press release from the California High-Speed Rail Authority is posted below. SAN FRANCISCO, Calif. — The California High-Speed Rail Authority Board today passed a 2012 revised business plan that will provide for high-speed rail service within a decade, connect the state’s major metropolitan areas, utilize existing rail infrastructure in northern and southern California and provide earlier statewide benefits to commuters in the Bay Area and Los Angeles at a cost of $68.4 billion. “I am pleased to announce today that the High-Speed Rail Authority has taken a huge step forward toward making a coordinated statewide transportation network a viable reality,” said Authority Board Chair Dan Richard. The business plan was adopted with an amendment committing the Authority to work with transportation agencies in Orange County to identify cost-effective ways to enable a one-seat ride to and from Anaheim. As part of the amendment, the Southern California Passenger Rail Planning Coalition will consider options for a connection that will cost less and be less intrusive than a full-build connection enabling the one-seat ride to Anaheim. The Board unanimously approved a Memorandum of Understanding with Southern California transportation agencies and MPOs. This document outlines a shared commitment to advance the development of high-speed rail while providing funding for local early investment projects in Southern California that will improve rail service immediately. This agreement is designed to set the stage for construction to begin on needed Southern California infrastructure projects as early as next year. In another unanimous decision, the Board approved a Memorandum of Understanding with Northern California transportation entities. This would electrify the popular Caltrain commuter train from San Jose to San Francisco. The MOU, which has been approved by the Metropolitan Transportation Commission, calls for local and regional entities to provide funding for just over half the $1.5 billion agreement. The Authority would provide $706 billion from 2008 Prop 1A bond monies. Elected officials, advocacy groups and individuals overwhelmingly spoke in favor of the business plan at the meeting. “I hope to see, in the near future, trains pulling through all the way from Los Angeles to the Central Valley, through Silicon Valley to San Francisco’s Transbay Terminal, which we believe to be the Grand Central Station of the West,” said San Francisco Mayor Ed Lee, speaking in favor of the business plan at the meeting. “I appreciate that High-Speed Rail embraced the proposal for a blended system that Peninsula elected officials, namely Congresswoman Anna Eshoo, State Sen. Joe Simitian and Assemblyman Rich Gordon called for a year ago,” said Adrienne Tissier, who chairs the Metropolitan Transportation Commission, Caltrain and the San Mateo County Board of Supervisors. The business plan adopted Thursday was shaped by public feedback drawn from nearly 300 statewide meetings with landowners, elected officials and the public, as well as 250 public comments received over a two and a half month comment period. FYI – Print copies of the CicLAvia Architecture Guide will be available all over the CicLAvia route – at all six hubs, and all 20+ volunteer-staffed intersections – should be easy to find out there on Sunday! 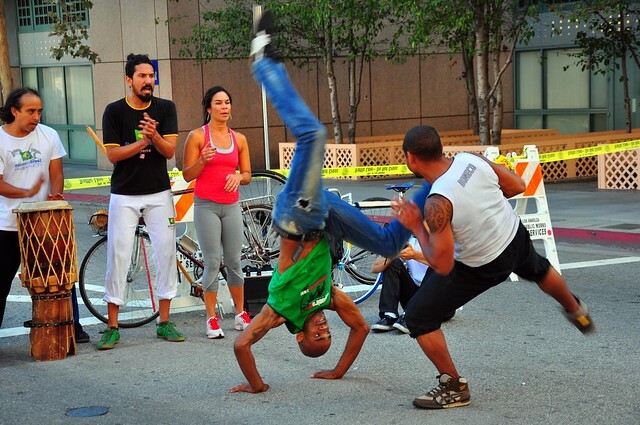 also – great CicLAvia capoeira photo!!! The Pink Line is a great blog for transit in LA and it’s nice that the northern extension of the crenshaw line is being discussed more now. As far as that article is concerned on which alternative is preferable, my first instinct IMO would be the Fairfax route as it balances the proximity to destination points with speed/more direct routing. It seems to be a happy medium. The other route to the west would be my personal second choice due to directly hitting key dense points of interest even though its a bit of a detour. The La Brea option is the least preferable because it is further from major destination points than any of the other options. This line should be grade separated at least at the very minimum between Wilshire and the Hollywood/Highland terminus. Thank you for including my blog post in your headlines, and thank you for your comment Connor.